The demolition of Wallsend Boys Club started yesterday (Wed 29th February 2012) after being condemned due to high winds which caused severe structural damage. The club which was founded in 1904 by the employees and directors of Swan Hunters was originally a series of wooden huts on Station Road which were erected by workers from the shipyard, but after a fire destroyed these, work commenced on a new club building which was opened on 16 December 1966. 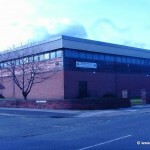 Activities such as snooker, table tennis and of course football, from where the club gained a national reputation for the early development of many Geordie Football legends, such as Alan Shearer, Peter Beardsley & Lee Clark to name just a few. An online petition will be presented to funding organisations in an attempt to raise the estimated £750’000 required for a new building to be built in the grounds of Bigges Main where the local golf club is run from. Why has North Tyneside Council very little commitment to the youngsters of Wallsend? Why was it not possible to rebuild Wallsend Boys Club on the same site where it had been standing for many years? Surely if they had the skills to build a new one on Rheydt Avenue, they could have rebuilt the old one in the original place. Was it because the Council wanted to sell the land, and that sale was more important than the welfare of hundreds of young people who now have lost a valuable asset? Hands up anyone who thinks that Wallsend Boys Club is still a going concern and catering for hordes of youngsters every night? Step forward, please, anyone who thinks that the club still provides five a side facilities for all the kids who were seen happily lugging their haversacks up and down Station Road in readiness for their eagerly awaited game? Gather round all who think that hundreds of kids will be ‘off the streets’ and having fun at the Bigges Main club during next week’s half term holiday. The reality is that the Boy’s Club is effectively closed. Only the name still exists.The Rheydt Avenue is rarely open. I have been there on many occasions at different times and found the gates locked. There are no opening times displayed. The schools are on holiday next week but it will easier to spot a Tasmanian Devil going through the gates than a school kid. Your correspondent Ted Frobisher is right in noticing that the Council have quite a few sites that could have been used by the Boys’ Club, but don’t seem to have been offered. Surely with a bit of tinkering, Wallsend Library or the old Buddle School would have made an ideal Boys’ Club. Before I get off my soapbox.—- If it was not safe to rebuild the old Club, can the surveyors give a guarantee that the occupiers of the new dwellings can sleep soundly in their beds? Can anyone tell me if Wallsend Boys’ Club is still open. I’ve been past the premises on Rheydt Avenue several times, but the gates are always closed, even during the summer holidays. Thanks for your reply. I have contacted the manager of the Boys’ Club who tells me that the Rheydt Avenue premises is a ‘training facility’ only. Further investigations seem to indicate that the club is no longer in existence the way it was in the old Station Road days. This is a great pity because the big attraction were the five a side leagues which allowed all grades of kids to partake in competitive sport, a great character builder and even better for keeping ‘kids off the streets’. There does not seem to be the facilities for five a side any more. When the Station Road club was knocked down, the Trustees said that the Rheydt Avenue site would allow all the facilities to be in the same place. This has not happened. It is puzzling why the new club (almost in Newcastle) was built when there are several buildings in Wallsend which would have served the purpose much better. Wallsend Library would have been ideal. The old Drill Hall, Town Hall, Fire Station, Buddle School and others would have saved the cost of a new building. Were these ever considered? I don’t think the kids in Wallsend have been given a very good deal. In the unlikely event of the Rheydt Avenue site ever providing a full programme of facilities including a five a side pitch, there’s no way on earth any parents are going to let their children head up to Bigges Main on a dark winter night. Bring Wallsend Boys’Club back to where it belongs—-Wallsend. I also heard (around the time of the old Wallsend boys club demolition) that the boys club trustees were discussing using the site or a site “nearby” to the boys club pitches at Bigges Main, for a new boys club run in the same way as the old one. Lets hope this is still being planned or “as you say” another boys club being set up in the Wallsend area. hello, my son is a goalkeeper in the under 10’s for forest hall(matthew cowey) and we have been looking out for a new team for next year.